Anniversaries are meant to be for celebrations--aren't they? How do you "celebrate" a life-threatening, life-changing event? Today marks the 2-year anniversary of the first of three major surgeries in 3 1/2 weeks that I went through. It reminds me of the time I spent 14 days straight in the hospital and went through the most excruciating pain I've ever felt. I try to use this day as a catalyst and a point of encouragement--a positive thing. I tell myself that focusing on the negative and the "bad" memories aren't productive and instead will only lead to despair and depression. After all, it's important to always look on the bright side and keep moving forward, right? My emergence from this ordeal has strengthened me tremendously. It was caused me to understand things about myself that I never would have learned otherwise. Because of this I have embarked upon a journey of "release" and "living boldly" in order to "think bigger" and be better. I used this event as fuel to a never-ending fire and drive into "beast mode". I harnessed my resurgence and turned it into books, speaking topics, strategy sessions and countless "Note 2 Self" entries. My "anniversary"; my "celebration"--this 2-year mark that I am reminded of everyday as I look at the scars on my body--is done in solemn remembrance of who I was and who I became on the other side of the journey. So when you can understand that the things that happened to you and because of you are all necessary and that your life's journey is made up of mountains AND valleys--then you can truly embrace the process of living and become "Released and Ready" to truly Live Boldly and "Think Bigger" as you move ever--forward. How do you remember the "not so good" times? How do you give homage to the events of your past? How do you quiet the voices and escape the shadows? How do you make the moment last? How do you embrace what's new, without discarding the old? How do you strive to reach the top, without feeling you've sold your soul? How do you encapsulate a lifetime of experiences---into a single moment in time? How do you stand apart from everyone you've encountered--and try to make your light shine? How do you learn all of the countless lessons, that life always tries to teach? How do you constantly keep striving for goals, that seem always just out of your reach? How do you remember who you are, when life tries to beat you down? Just remember the essence of your true self, and envision upon your head a crown. Because if it weren't for the experiences that you've encountered, then you actually wouldn't be YOU. Not just "kinda afraid" or a "little uncomfortable"--no, I mean really, uncomfortably scared. I almost drowned as a child and spent five days trapped in New Orleans during Hurricane Katrina so as a result of those experiences, I developed a fear of water--especially being submerged or having my face wet--and thanks to my ordeal with Katrina--a fear of thunderstorms as well. 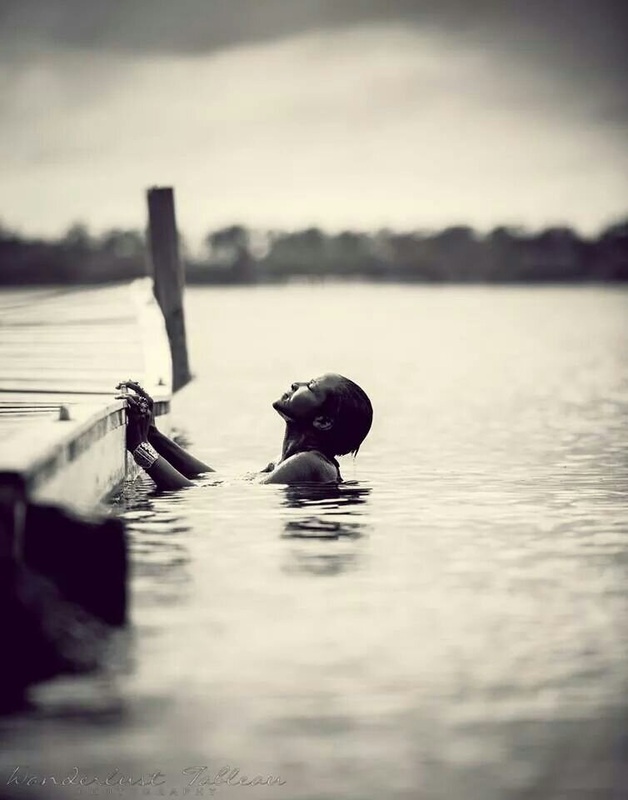 So when I embarked on my latest adventure in my journey to #liveboldly--trying my hand at modeling--imagine my shock and surprise when the photographers at the weekend photo shoot wanted me to get in the water. But not just get in--go ALL in and UNDER! So here I am, dressed in a bikini (which in and of itself was a battle overcome), surrounded by five photographers who were waiting expectantly for me to get in the water so they could get their next shot. I could refuse and back out. In a split second I made my decision. I chose option 2. Don't get me wrong--that wasn't an easy decision by any stretch of the imagination. There was an internal battle waging between my head and my emotions somewhere down in the pit of my stomach where the forces clashed and jockeyed for position---but I had to determine if I was going to let my fears govern how far I could climb in life, or if I was going to make that determination for myself. I realized that if I continued to stand down and back away each time I confronted a fear, that I would forever be at their mercy. There would be no way that I could rise above and beyond them to truly be the creator of my success. Instead, I would remain a victim of my circumstances. After years of being defined and confined by my fears and limited by the choices that I made as a result, I was finally ready to make a decision (and honor it with action) by saying "no more" and taking the plunge--literally. I would like to say that I entered the water boldly and confidently--after all, this was a big moment for me. But in reality, I entered cautiously--feeling my way forward gingerly one step at a time to be sure of my footing as I traveled further into the lake and the water rose higher up my body. Just because you make a life-changing decision doesn't mean the fear goes away or you suddenly develop the strength of ten lions--plus two. Those thoughts and emotions are still with you. You just have to keep moving and keep acting in spite of what you think or how you feel. So when I finally reached the point in the water where I had to duck under the water, I stalled. It was cold. I was freezing. I thought I saw "thingies" swimming by. There were a million reasons why I told myself it would be okay not to go any further. I'd overcome a lot just by coming this far. I didn't have anything else to prove. No one would know. But if I backed down, I knew I would know. I wouldn't let me get past it--and the next time I faced a crossroads it would be easier to give in and go backwards. So I took a deep breath and took the plunge. I went under the surface of the water and sat there for a moment, taking it all in and realizing that I was doing it. That thing that I was afraid of. I WAS DOING IT! Then I V-E-R-Y S-L-O-W-L-Y came up out of the water, turned to the cameras and gave a knowingly triumphant smile. The photographers loved it, but more importantly, I loved myself for facing another fear and taking the plunge to #liveboldly instead of retreating. What are you holding onto? What actions and dreams do you want to take but are letting fear, doubt and excuses prevent you from claiming what is yours? Release it. Become Ready to make your decision and honor those decisions with action. Take the plunge with me and #liveboldly. Topic: What's the best way to pursue your purpose? Today we get the opportunity to learn about two business owners and what started them on the path to their purpose. They will inspire you through their stories sharing with you that you can do the same in your life....live your dream that is. Connect with me on Facebook at https://www.facebook.com/releasedandready. Welcome to the beginning of the rest of your life! Sometimes the potential that we see or feel within ourselves--and especially the potential that others see within us--is so far beyond what we envision for ourselves that we run from it. It doesn't matter what kind of car you drive right now, what kind of house you live in, where you work--or don't work, what you look like, what you sound like, where you went to school, where you're from, what you don't have or even what you do. The bottom line is that you have to tell yourself--and believe--that you ALREADY ARE the wonderful, exceptional, talented, gifted person that you are afraid to be. You just have to set yourself free--RELEASE YOURSELF--and get out of your own way. Just because things have happened TO you, does not mean that those things DEFINE you. It IS possible to move beyond, above and past the things of your past and those circumstances that comprise your present. All you have to do is make a decision that you will be successful, profitable, joyful and start living the life that is meant for you. You’ve picked up this book (or downloaded it, as the case may be) because you are sick and tired. Sick and tired of being overwhelmed, under-appreciated and unfulfilled. Sick of always putting yourself last because of everyday occurrences when “LIFE HAPPENS”. Sick of feeling that everything in the universe seems to work against you instead of for you. Sick of feeling that there is something more out there for you and to you that you are just not tapping into. Sick of having that feeling that you’re not doing what you’re meant to be doing with your life and that you’re not at all where you think you should be. But being sick and tired is not enough. It is just the beginning. This book is the next step. This book is about taking a journey. A journey to discover who you really are so you can get what you really want and go where you really want to be in life. It’s about changing not only your attitudes, but your actions as well so that you can create a new expectation, a new model and a new reality of your life and all aspects in it. When was the last time you made a DECISION? No, I mean real decisions. What most of us do in our daily lives is make choices. Choices consist of selecting from options that are presented before us—this or that or the other. When you make a choice, you’re ultimately not responsible for the outcomes because it really wasn’t your decision. You just had to choose from the options that were presented before you. There wasn’t much thought given to what happens after you make the choice. Usually you make the choice and then move on from there. At the next crossroads, you make another choice, and so on. Choices are external. The control is not yours. The outcomes from choices are predetermined based on the options that are presented. You are simply choosing which of the outcomes you prefer to deal with—or not deal with—as the case may be. When people make choices, they seldom accept responsibility for any of the outcomes that come with them for the simple fact that they weren’t involved in making the decision that led up to the choice. Even when you say the words “I choose”, you don’t feel in control. You feel as if there’s still some doubt—as if the other option still might be better. Think about it. When a waiter asks you what you’re having, and you say “I think I’ll choose the fish.”Do you sound certain about that? Is that your final answer? Or when you tell someone that you’ve “chosen to start your own business” or “chosen to go back to school” or even that you’ve “chosen to take the day off”, do you find that they question you? The problem isn’t that you’re not respected. The problem is in your choice of words and actions. You’re making choices when you should be making decisions. Now, decisions, on the other hand, are by their very nature concrete. They bring with them a feeling of being in control; of finality of someone who knows what they want and will not be questioned or second-guessed. Making decisions implies that you have weighed all of the possible outcomes; examined the situation from all angles; understand all of the variables involved and that you come to the best conclusion possible and determined that this is the course of action that you will take as a result. Making decisions implies taking responsibility for the outcomes. Making decisions implies that you are in control. Making decisions implies that you are not to be questioned, because there is no doubt and nothing left to be explored. Making decisions is proactive way of controlling your life, while making choices is reaction to circumstances. Now, repeat the same scenario from before, this time make some decisions instead of choices. When a waiter asks you what you’re having, and you say “I have decided to have the fish.” How do you feel as a result? What do you believe the impression is this time as opposed to before? Or when you tell someone that you’ve “decided to start your own business” or “decided to go back to school” or even that you’ve “decided to take the day off”, do you find that they question you now? It’s the same, yet incredibly different. The first step to becoming Released and Ready is to make a decision—not a choice. You must make a decision to be different. You have to decide to find those things that fuel your passion; align with your purpose and build your legacy. You have to decide that you are committed to be what you need to become in order release all that you are and are meant to be. The first step to being Released and Ready is to make a decision. Part of the key to truly becoming released and ready is to look beyond the vision of yourself that you see in the mirror and to look at yourself as others see you. Far too often, when we consider anything having to do with ourselves, we always look at situations from our perspective–that means that if it has anything to do with us, we automatically bring our “baggage” with it and factor in our own set of assumptions, background knowledge and back story into the equation. But all that does in most cases is complicate things–because to be quite honest–most times, when people are dealing with us, they’re only dealing with us based on the situation and the circumstances at hand. No one is bringing into play what happened last year, last month or last week. No one is considering any of our past issues, failures, or shortcomings. Many times when we enter a new situation, we immediately self-sabotage it because we bring all of these issues, insecurities and preconceived notions of things that can potentially go wrong–instead of walking into it thinking about all of the possibilities of what can go right. First, look in the mirror and immediately say out loud all of the things that come to mind to describe yourself. Write down your responses. Secondly, close your eyes and think about yourself in a setting where you are in your “element”–on your “A” game and being successful at what you are meant to do–whatever that may be. With this picture in mind, immediately say out loud all of the things that come to mind to describe yourself. Now write down your responses. Now compare the two sets of responses. What do you notice about the way that you described yourself when looking at yourself in the mirror? What do you notice about the words you used to describe yourself in your “element” and being successful? What this exercise points out is that sometimes we need to step outside of ourselves to really see ourselves–both good points and not so good points. It’s always better to gain another perspective when gaining new insights and determining the best way to approach personal and professional growth and development. The key to becoming released and ready is to understand that you can’t continue to remain “stuck” in your own perspective and trapped in your insecurities if you want to become ready to fuel your passion, align with your purpose and build your legacy. Sometimes you have to look beyond the mirror. You just might be pleasantly surprised at what you discover. 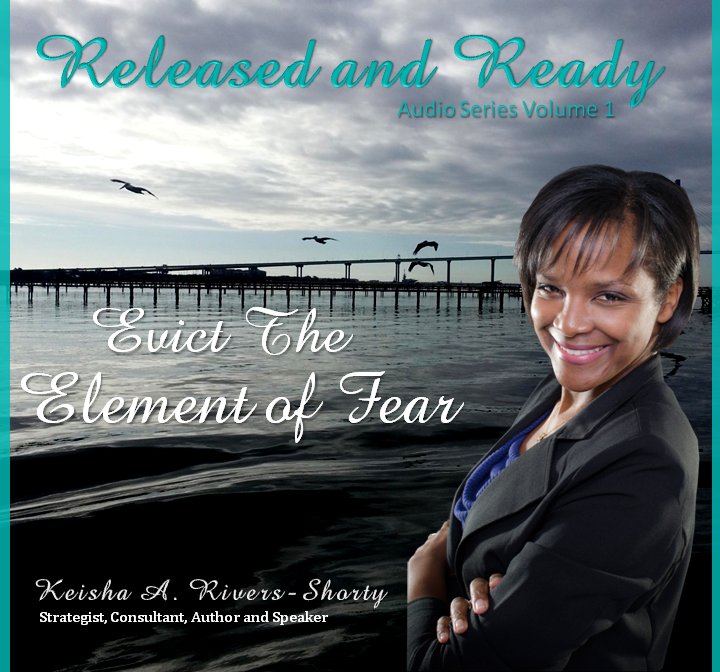 Keisha A. Rivers Shorty, Strategist, Consultant, Speaker and Author. Please note: You'll receive the audio series within 24 hours of sign up.